The German air force has had a busy opening three weeks to its first NATO deployment involving the Eurofighter combat aircraft, with so-called "Alpha" scrambles having been launched to intercept Russian air force transport and surveillance assets. Two aircraft from the Luftwaffe’s Fighter Wing 74 (FW74) were first launched from Lithuania's Siauliai air base soon after assuming the air policing mission for NATO members Estonia, Latvia and Lithuania on 1 September. 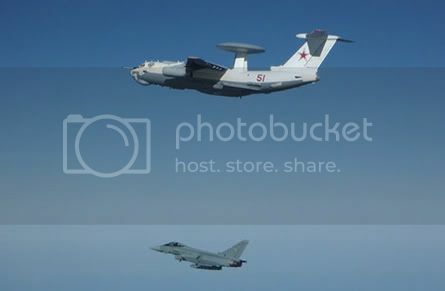 Eurofighter partner company Alenia Aeronautica says the pair took off within 6min of receiving an order to intercept a contact in international airspace over the Baltic Sea which turned out to be a Russian Antonov An-72 transport. The fighters were alongside it within a further 9min. “The An-72 remained in the area for over 50min, always closely monitored,” the company says. The Luftwaffe says a second intercept was performed on 15 September, after another aircraft "flew very close past the border of the Baltic airspace". 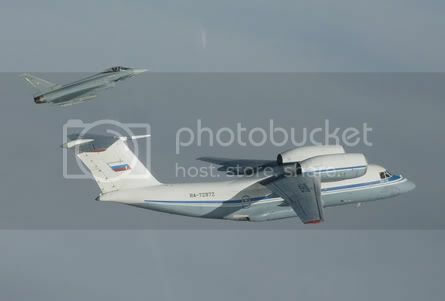 Its Eurofighters flew close to a Russian air force Ilyushin Il-76-based A-50 airborne early warning and control aircraft, prompting two accompanying Sukhoi Su-27 fighters to break away from the surveillance aircraft. These were subsequently intercepted by Finnish air force fighters. The A-50 had been accompanied by Su-27 fighters which subsequently bugged out when approached by allied fighters. Ordinarily based at Neuburg-Donau in southern Germany, FW74 will maintain its detachment of Eurofighters in Lithuania until 1 November, when they will hand over responsibilities to German air force McDonnell Douglas F-4F Phantoms for another two months. 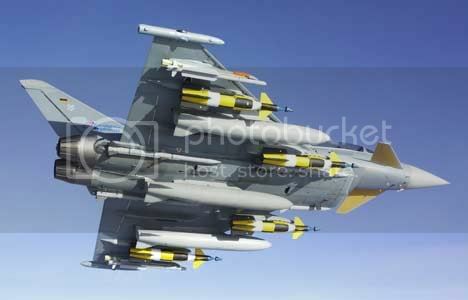 Germany’s Eurofighters are armed with Diehl BGT Defence IRIS-T short-range air-to-air missiles and a 27mm Mauser cannon for the air policing mission. Well, good job by the Germans, but the A-50/Su-27 formation, that wasn't a kind of accidental intrusion. Russians are clearly testing Typhoon response times, and the A-50 got a very clear picture of that. Not sure about how much of the sensors it can pick up. Maybe next we'll see some old Cold War relic with some sniffing equipment onboard too, the An-72 seems like a 'normal' example. What would they get out of testing response times? If they ever tried anything with the allied air forces most would be blasted from the skies by superior aircraft and pilots. The rest would have engine failure. yellow missiles.. are they warshots? Er what they are Gripe is an 'add on' photo to the story and an opening for Niels to shoot me down and say that those aren't used by the Luftwaffe. Don't want that bloody AVIATOR saying stuff about military aircraft. It's one way of finding out true early warning radar ranges as opposed to what Janes states. There will be a lot more involved in it, but testing response times will draw up a picture of NATO's command and communication structure. The yellow-black weapons are laser-guided munitions. Bombs of the Paveway series. Is it just me or are the underside of the canards yellow to? Russian subs used to move in close to the Northeastern seaboard to where we would have to scramble our Nuclear-laden Alert aircraft and they would 'time' our response times. We had to ensure we could get our planes airborne BEFORE their Nukes could hit the base. Sometimes they would get so close, we would have to stay on 'cockpit' alert which meant staying right in the plane for as long as they were close. Ah, I miss those Cold War 'games'. Next time, try posting a picture of the BAe EAP if you want to trigger me. Or better yet, a Rafale.